Work sample: "Trying to Find My Lil' All 'n All" is a personal essay published in The Georgia Review in 2017. It is part of a book-in-progress, a hybrid nonfiction that combines memoir, literary journalism, and song biography. Its starting point is the song, "Sitting on Top of the World," recorded by the Mississippi Sheiks in 1929 and since re-recorded hundreds of times by performers in blues, jazz, Texas swing, bluegrass, rock, and gospel. The song – tied to the inexplicable, mutable nature of human happiness and sorrow – compels me now to consider other essential questions at the song’s core. In this essay, I connect a road trip to visit my parents to the song's meaning. "The Reverend" is a personal essay, originally published in River Teeth, a journal of literary nonfiction. The essay concerns an invitation to officiate at a friend's wedding, using that as a means to explore questions of faith and spirituality for a lapsed Roman Catholic, leading to a stronger appreciation for those who pursue a committed, religious life. Originally published in Prairie Schooner, the short fiction story, "Duty, Honor, Country" moves among points-of-view to tell the story of one rainy night when a family falls apart. THE GREATEST SHOW: STORIES, a collection of ten linked short stories published by Louisiana State University Press. Three of the stories received special commendation in the Best American Short Stories series as "distinguished stories." In the opening story, Ania Liszak, a young Polish housemaid, steals circus tickets from her employer to take her three-year-old son, Teddy, to the matinee. The fire nearly kills both and leaves them scarred in different ways: Teddy's mother enjoys the beautiful strangeness of the scar on her face, but the patches across Teddy's body inspire cruel schoolmates to call him "Lizard Liszak." Over time, his mother transforms her pain into drama, while Teddy, having no memory of that day, seeks ways to return to it. These and other captivating characters appear throughout the book, creating a portrait of an American city and its people over five decades, raising questions about wounds and healing, memory and forgetting, and about the human capacity for kindness -- with all its futility and power -- in the midst of great loss. This review of THE GREATEST SHOW from Foreword magazine calls the book, "an auspicious fiction debut." FLASH NONFICTION: Isn't It Fun How We Shine? ISN'T IT FUN HOW WE SHINE? is a collection of flash nonfictions, made possible in part by a Rubys Artist Project grant. The Rubys were conceived and initiated with start-up funding from the Robert W. Deutsch Foundation and are a program of the Greater Baltimore Cultural Alliance. Several of the flash essays will appear this winter in The Southern Review. Others have already appeared at Sport Literate and at Literary Hub. With more than 50 written, I plan to turn them into a limited-run podcast. "Double Play" was one of the first flash essays I wrote as part of the project, ISN'T IT FUN HOW WE SHINE? It was originally published in the journal, Sport Literate. 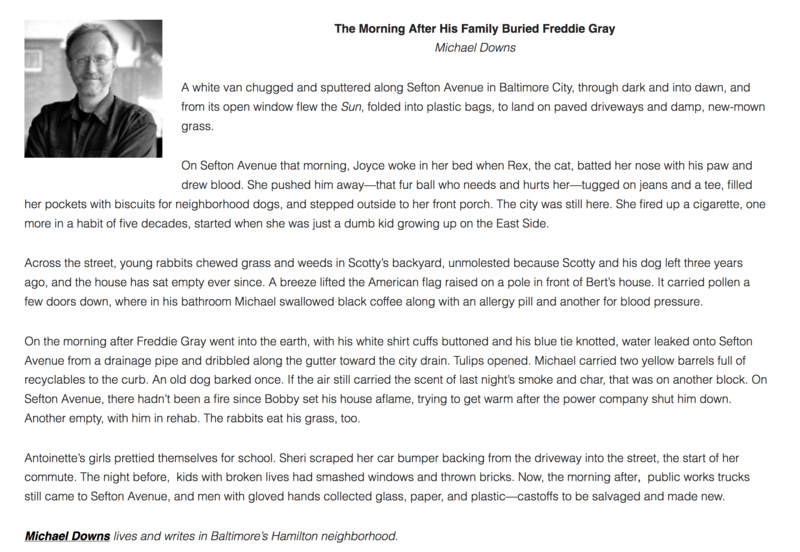 This is the recorded version of "The Morning After His Family Buried Freddie Gray," read by the author. Copyright Michael Downs, 2016. This novel, forthcoming from Acre Books in May 2018, reimagines the life of Horace Wells, a Connecticut dentist and anesthesia pioneer. Its first chapters received a grant from the Maryland State Arts Council. In December 1844, Wells encountered nitrous oxide, or laughing gas—then an entertainment for performers in carnival-like theatrical acts—and began administering the gas as the first true anesthetic. His discovery would change the world, reshaping medicine and humanity’s relationship with pain. But that discovery would also thrust Wells into scandals that threatened his reputation, his family, and his sanity—hardships and triumphs that resonate in today’s struggles with what hurts us and what we take to stop the hurt. In this novel, I mine the gaps in the historical record and imagines the motivations and mysteries behind Wells’s morbid fascination with pain, as well as the price he and his wife, Elizabeth, paid—first through his obsession, then his addiction. The book is a love story, but also a story of what love can’t redeem; of narcotic dreams and waking insanity; of humbug and miracle; of pain’s destruction and what pains can never be eased. Following Wells throughout New England and across the ocean to Paris, the novel immerses the reader in the nineteenth century, conveying through rich physical description and telling dialogue the tragic life of a dentist who gave everything to rid the world of suffering. 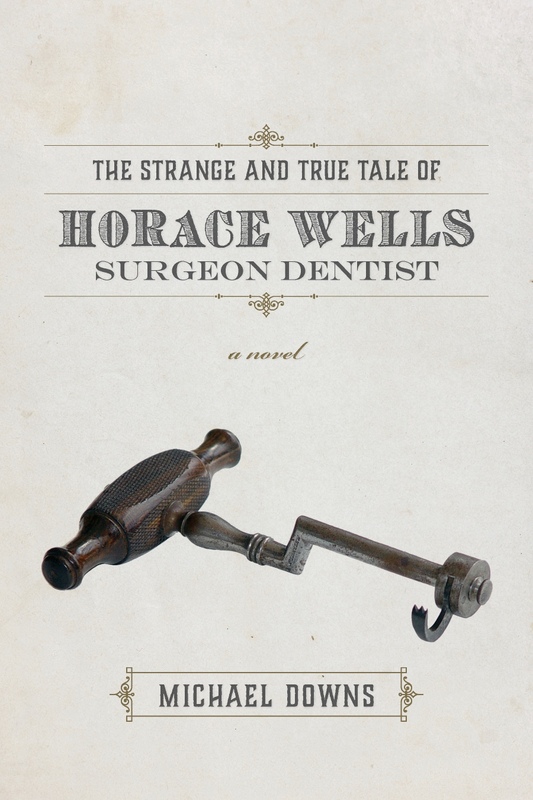 The cover of THE STRANGE AND TRUE TALE OF HORACE WELLS, SURGEON DENTIST: A NOVEL, forthcoming from Acre Books, May 2018. In a moment of national horror – the bombing at the Boston Marathon – I received a request to present the keynote speech at the Maryland State Arts Council banquet honoring recent awardees. The coincidence sparked a meditation on the role of art in the worst of times, which I presented at the ceremony and later published at the website Baltimore Fishbowl. The written essay can be found here. A video of a keynote speech written and presented for the Maryland State Arts Council's annual awards banquet. HOUSE OF GOOD HOPE: A PROMISE FOR A BROKEN CITY combines reportage and memoir to tells the true story of five young men who met as high school athletes and who as a group pledged their lives to Hartford, Connecticut, promising to bring college degrees home and to live and work in their broken city. It won the River Teeth Prize for Literary Nonfiction and was a finalist for both the Saroyan Prize and the Connecticut Book Award in Biography and Memoir. It was published by the University of Nebraska Press. The stories of the young protagonists involve murder, love, sacrifice, success at the highest levels of college football, marriage, birth and death, a beating at the hands of police, a drug-sting that fells a high school coach, and a final reunion of friends who have learned how hard it is to simultaneously love their city and live for the future. The book also traces the life of the author’s family through four generations as they live in and leave Hartford, abandoning the author’s ailing grandparents to a city that shows little mercy. The book explores essential questions: What happens to those we leave behind? How do we make peace with the past we have sacrificed? How do we make peace with ourselves when we can no longer help the places – the Hartfords – that we once called home? 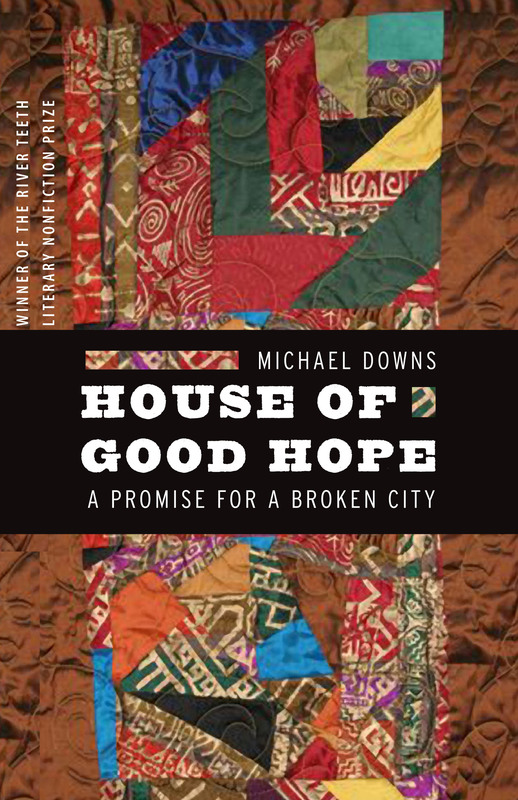 The cover for HOUSE OF GOOD HOPE: A PROMISE FOR A BROKEN CITY, winner of the River Teeth Prize for Literary Nonfiction. The cover background is detail from a quilt, "All that Amazing Jazz," by Hartford, Connecticut quilt artist Ed Johnetta Miller. Photo by John Ryan. These are the prologue and first chapter of HOUSE OF GOOD HOPE: A PROMISE FOR A BROKEN CITY, winner of the River Teeth Literary Nonfiction Prize.